Power for All, a global advocacy campaign for distributed renewable energy (DRE) has concluded its training program for state-level policymakers, faith-based institutions, civil society organisations and trade associations on how to use DRE solutions to accelerate the rate of electrification and end energy poverty in their respective states. Workshops on these were recently held in Awka, Anambra State and Kaduna, and were tagged: â€œDRE101/X-Learning Workshops,â€ under the Scaling Off Grid Energy (SOGE) project of Power for All. The SOGE according to a statement from Power for All in Abuja, was designed to work with governments at national and sub-national levels to use DRE to increase electrification rates nationally and within states. It explained that the overall goal of the SOGE was to ensure the federal governmentâ€™s aim of achieving an electrification rate of 75 per cent nationally by the 2020 would be realised. According to it, the SOGE Grand Challenge for Development is funded by the Global Development Lab of the United States Agency for International Development (USAID) and Power Africa, but implemented in Nigeria by FHI360 and Power for All, with an intention to provide 20 million households in Sub-Saharan Africa with access to modern, clean and affordable electricity through DRE solutions. It explained that DRE solutions which range from pico-solar solutions and stand-alone solar systems to mini-grids and mobile solar farms, have the advantage of being readily available, affordable, and immediately deployable. 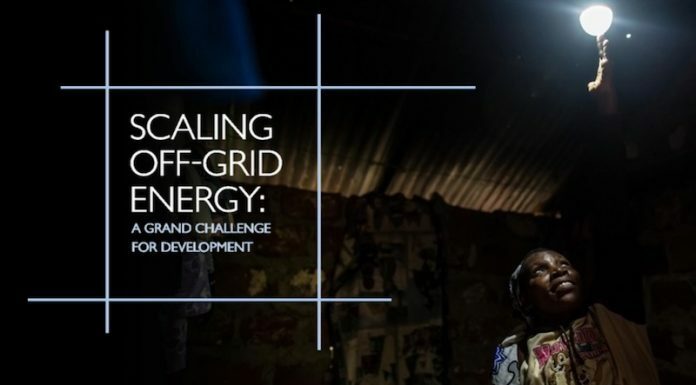 â€œThis allows the energy access to be delivered to consumers in a number of days, versus the years it takes to site, permit, build, and manage a traditional centralised fossil fuel grid system, and can be an important tool for Nigeria to better exploit the full range of its renewable energy resources, especially with delivering energy services to last-mile communities trapped in energy poverty,â€ the Power for All explained a statement sent to THISDAY. It noted that workshops held in Kaduna and Awka were the conclusion of the first phase of the state-level trainings which held in eight states â€“ Kogi, Enugu, Kano, Oyo, Cross River, Abia, Kaduna and Anambra, from where 400 state-level policymakers across five regions of Nigeria were trained. According to it, the workshops have increased the awareness level of the policymakers regarding DRE solutions as well as increased their options of scaling access to electricity in their domains. The workshops, it added have produced numerous outcomes, which include plans for states to set up regional taskforces to drive DRE in their domains; research on how some states can share power generated; states pledging to adopt DRE policies and plans; collaborating with neighboring states on setting up an industrial park for the assembly of DRE components; and starting discussions with developers on DRE investments in their domains. Speaking on the outcome of the workshops, Ify Malo, the Country Manager of Power for All, said: â€œLack of access to electricity is arguably Nigeriaâ€™s biggest infrastructural challenge, and has forced people and businesses to resort to inefficient forms of energy and lighting through fossil fuels such as kerosene which comes with a lot of costs â€“ financial, health, safety and environmental costs. â€œAs a global campaign, Power for All believes that the fastest way to achieve universal access to clean, modern energy is through the acceleration of DRE which eliminates these costs.